The top airlines to pick if you are through with dull in-flight dinners. Strapped to an airline seat 35,000 feet above the ground, you hear a low grumble. Your tummy's clearly disgruntled that it hasn't been fed in the last four hours. You gesture to the flight attendant, and she wafts over to your side with a smile. "I would like something to eat, please. What do you have on the menu?" "Right now, that would be a chicken-jalapeno sandwich. Sir." "Umm... could I have something without chicken, please?" "That will be a chicken-jalapeno sandwich, minus chicken. Sir." You shrug your shoulders helplessly, and ask for the sandwich anyway. A bite later, you grimace and wish you hadn't. Now, as much as you would like to blame the airline staffers for making a tasteless sandwich (the utter lack of options notwithstanding), it would only be fair to note that foods simply have a tendency to appear non-appetising when ingested thousands of feet above ground level. Why, you ask? Well, modern aircraft can climb to altitudes of 35,000 feet, but the pressurised cabin makes one feel as if it's just a little more than 6,000 feet. While this does make breathing easier, it has a gastronomic downside - the air pressure numbs your taste buds, causing the food to appear blander. The comparatively lower level of cabin humidity (by almost 20 per cent) makes things worse, weakening your sense of taste and smell. The air conditioning, not to be outdone, dries up the food instantaneously - turning a nice breast of chicken into something akin to sawdust before you can even hope to devour it. Now, this could have led to quite a tragic scenario for gourmands travelling long-distance if our favourite airlines hadn't decided to do something about it. Fortunately, they did. Today, most airline carriers have bid farewell to the packaged sandwich - instead taking steps to turn entire aircraft into luxury restaurants. Plastic trays and paper cups have given way to bone china plates and crystal wine glasses, and celebrity chefs from Michelin-starred restaurants whip up culinary surprises (with an extra dash of flavour) for you at the tap of a buzzer. If you don't feel like Chinese, there are a hundred other cuisines - from Continental to Lebanese - for you to choose from. 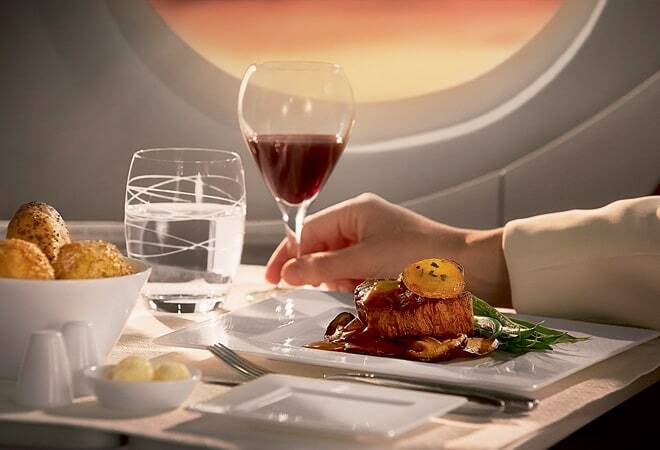 Here's a look at the top five airlines you should board, if fine dining is your thing. 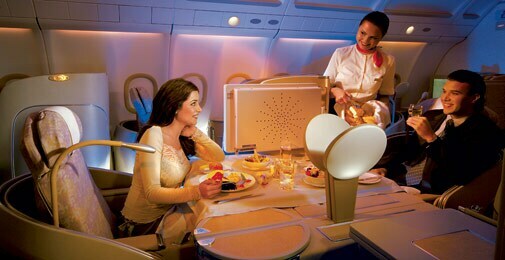 Planning to snooze your way through the Emirates flight to your destination? We sure hope you reconsider, because - ultra-luxurious private suites, fully flat beds and the shower spa notwithstanding - the chow they have on offer is to die for. Exclusively plated on Royal Doulton fine bone china and Robert Welch cutlery, you get everything from wild Iranian caviar to duck breast glazed with wild forest honey in one exotic gastronomic package. Says Essa Sulaiman Ahmad, Vice President (India and Nepal), Emirates, "We have over 500 international chefs from across the world in our catering team. 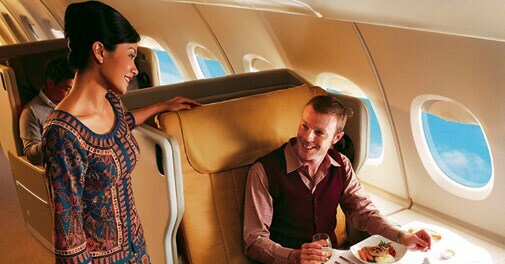 Here, we focus on providing a gourmet in-flight dining experience to our customers through all aspects of our service. Whether it's curry from India or sushi from Japan, we are always looking to learn from the local cuisine. Our menus reflect local tastes." Care for a glimpse beyond heaven? Take a ride in the Emirates Airline A380 aircraft, and you get all this - plus a chance to sip grand cru wines and nibble on canapes in lavish lounges manned by a dedicated bartender. We Recommend:Aubergine lasagne, braised beef in coconut milk, wild Iranian caviar. What do you get when you have heavyweight chefs like Suzanne Goin, Georges Blanc and Sam Leong sitting at a desk to decide on a common gastronomic agenda? No prizes for this one - it's the Singapore Airlines' menu book! Each trip through the skies in a Singapore Airlines flight is an experience in fine dining, and new dishes are developed and critiqued in a manner similar to military commanders reviewing their field strategies. To handle the air-pressure dilemma, in-house menus are created in a test kitchen that mimics the atmospheric conditions in an actual airline cabin. Even the spirits are not spared - each bottle of liquor is made to undergo palatability tests at high altitudes, and only the finest are allowed to be carted in. Those desiring the very impossible in the art of cooking must try their exclusive Book the Cook Service, which lets you select your gourmet main course at least 24 hours before departure. So, go ahead - sip some blessed Krug, sample some tender satay, and pray that your journey through the skies never ends. We Recommend:Nigiri sushi, crabmeat ee-fu noodle soup. They say that a good cook rarely feels at home outside his kitchen, but Nobu - a chef par excellence from Japan - just can't stop raving about the artistic freedom he gets from Qatar Airways. "They understand my philosophy," he gushes. "It's like a nice marriage, a balance in the foot." And why not, considering that he - in cahoots with other celebrity chefs like Tom Aikens, Ramzi Choueiri and Vineet Bhatia - has been given a free rein to impress every discerning taste bud on the firmament. Satisfy your palate and excite your senses with a wide variety of tantalising dishes prepared with a focus on the quality of ingredients. Plating is one area where Qatar never goes wrong. Here, you won't find steak sitting on your mashed potatoes or a trail of gravy stretching its way across one side of the plate; these guys can put the guys from MasterChef to shame. Watching a movie? Don't forget to buzz the flight attendant for a fresh tub of buttered popcorn. If you are on a quest for exquisite food and personalised service, look no further than an Etihad airliner calmly winging its way over the horizon. 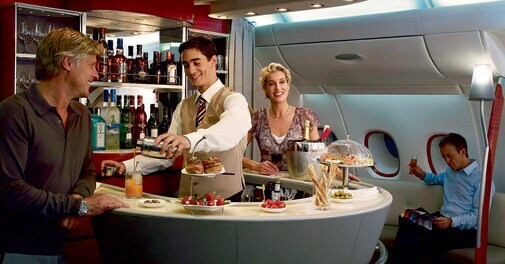 After all, these guys believe in spoiling their passengers silly with delectable bites prepared by expert chefs, complete with charming flight attendants and wine tasters to apply the finishing touches on a glorious journey to remember. Unlike other carriers, which prepare food on the ground and serve it to passengers after some fairly simple reheating, the chefs aboard Etihad do much of the cooking at the last moment. While the focus lies on modern Arabic cuisine, passengers can pick anything from an inexhaustible list of international delicacies - be it the Moroccan lamb tagine or the lip-smacking shio koji salmon - and customise it to their stomach's content. But what of the air pressure, you ask? Well, the food is made flavourful enough to withstand any such concern. We Recommend:Grilled tenderloin, lamb thareed, date and custard cake. Rest assured, there's nothing neutral about the cuisine onboard the Swiss Airlines. Here, you dine as you would in a gourmet restaurant - choosing your own menu and placing an order mid-afternoon or evening, never mind what the clock has to say about it. What Switzerland lacks in area, it makes up with the largesse of its cuisine - a fact that finds ample reflection in the menu book of its national airline. While top chefs across the globe present fliers with highlights from their individual culinary treasuries, a large part of the menu devotes itself to delicacies from the local cuisine. If you desire a taste of the Swiss heartlands, here's news. Through the latter half of this year, Swiss first and business class passengers will get a chance to sample culinary delights acquired from the canton of Geneva. Go wild on beef tenderloin with ofetori, Nidwalden-style mashed potatoes made with veal bacon and cheese, even whole chunks of the local Swiss cheese - nobody's judging. We Recommend:Chicken cordon bleu, braised lamb shank.